We have identified a number of release engineering best practices across eclipse.org projects. This topic is about promoting these practices and providing tools to encourage standardized adoption of these practices. We have discovered we are replicating tools across projects and this wastes valuable committer time. We want to encourage these practices because the most successful projects employ a high level of automation to reduce the amount of human induced error. Use a meaningful qualifer. For instance, use a qualifier that reflects the cvs tag in an integration build. Having the qualifier reflect the timestamp of the build for integration builds is not useful because all the plugins will have the same timestamp in the build regardless of whether they have changed or not. This will result in duplicate content in your update site and unncessary downloads by users. Implementation details available here . Track API changes - To see what has been added, changed or removed. Identify usage of internal APIs. It's recommended that the use of internal APIS be documented in a bug report with an explanation. Specify plugin dependancy requirements with a version range. Use execution environments to specify minimal JRE dependancies. Tag the map files and builder projects with a tag that matches the build identifier. This will ensure that you can run the build again, or branch to incorporate a fix if required. Have an update site; optimize update sites and implement pack 200 for a better update manager experience and significant reductions in bandwidth utilization at eclipse.org and mirrors. The JDT core team's, Distribution Diff Tool is a command line tool which compares two Eclipse based distributions and creates a report of the differences between them. It performs differences on the structure of class files, but does not compare resources (.properties, .gif, .jpg files etc.). This gives the user an idea of what changed between two builds, without having to wade through source changes. Regularly scheduled builds and automatically notify developers of build issues. Use the packager to avoid multiple recompilation of plugins and speed up the build process. 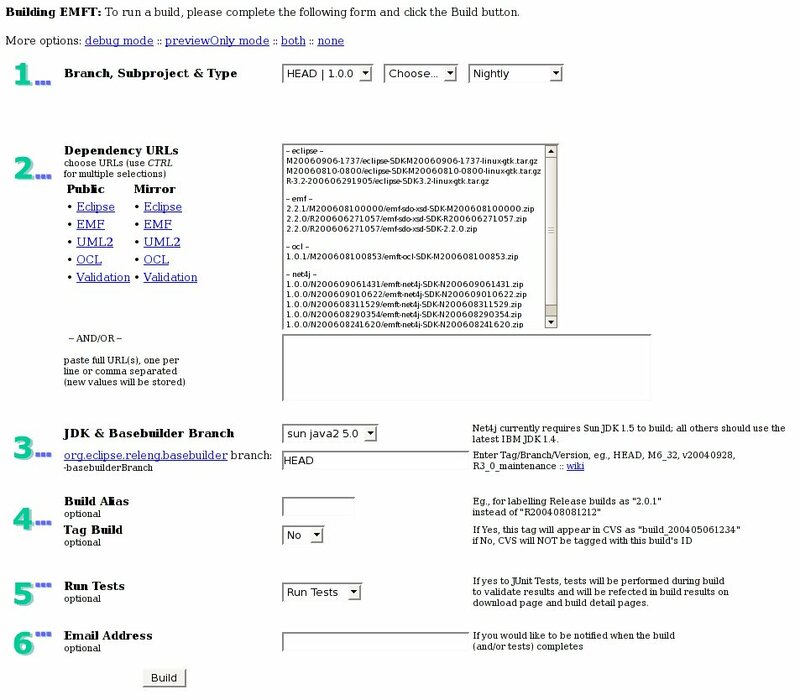 29-Sep Max will update his GMF build documentation as an example of how to write it correctly and put the doc on the wiki; will send email on cross-project-issues-dev@eclipse.org; Ben will edit for native English. Content should include a contact person should there be problems with understanding the build. September 29 - (Kim, Hubert, Sue, and Jeff) Provide all existing versioning tools for download and evaluation. Each writes a wiki page on their tool; also evaluate the other three pages. The team of four will either agree on a best one for all Europa or they will return to the cross-projects-issues-dev@ list with a request for more discussion. Tell the Planning Council to promote the best tool for use within the Europa Release. (Sept 29 - BIRT's tool is available in CVS, you can find it in org.eclipse.birt.build plugin, Oct 10 - Eclipse project tool is in org.eclipse.sdk.tests-feature/plugins/org.eclipse.pde.tools.versioning in /cvsroot/eclipse). October 15 Dave will ask a smaller project to provide their templates and Dave will write them up as a wiki page and solicit a vote from the cross-project-issues-dev@ list to the suitability of that result. Also ask EclipseCon 2007 to schedule a session around The Perfect Build. (1 November - Denis, Henrik, Sue) Set up a vserver for Buckminster/BIRT builds. Denis estimates that if we end up going with vservers, this will cost $750/project (in increments of 6); Denis will ask for money if that route is chosen. Predicted alternative: set this up on build.eclipse.org and don't have vservers. UPDATE: It has been determined that individual project vservers for building is not an option. build.eclipse.org is to be used instead. --Denis.roy.eclipse.org 15:09, 4 October 2006 (EDT); According to Meeting minutes for BIRT/Buckminster/Maven, this action item will be delayed to December 1. This page was last modified 13:53, 9 October 2009 by Nick Boldt. Based on work by ibnhatim, Nick Boldt and Sue Lee and others.